Their finds, long lost to the sea's icy depths, include a Japanese submarine laden with gold, an ancient Greek cargo vessel, and Israel's ill-fated Dakar. Now David Jourdan (MS '84) and his team are out to solve the ultimate 20th-century mystery: Where is Amelia Earhart? Johns Hopkins is teeming with monuments, from the Bufano owl at Homewood to the revered "Divine Healer" at Hopkins Hospital. Our subjective scouting report highlights the MVPs. What really lay behind the massive witch hunts of the Middle Ages? With his new book, Demon Lovers, Walter Stephens, professor of Italian Studies, upends conventional wisdom about centuries of cruelty and injustice. 10 ... and counting. That's the number of manned space shuttle missions that have carried significant contributions from Johns Hopkins scientists. Crew mission patches, unique to each flight, tell the story. This spring, with $728 million already committed, the university officially launched an ambitious new fund-raising campaign. We sat down with development's Robert Lindgren to see how he and his fund-raising team are gearing up to meet the challenge. 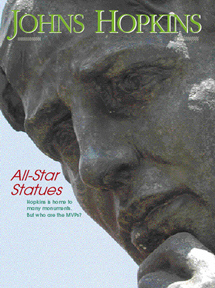 On the cover: The allegorical male figure from the Johns Hopkins Monument at Homewood.